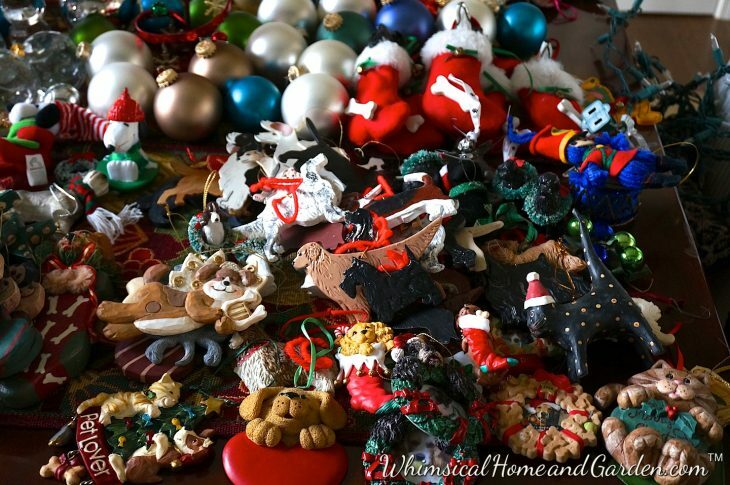 Last week I put away all of the Christmas decorations and I felt a little sad about it. What’s not to like about beautiful Santa faces, pretty wreaths and lights on trees? It means that for a full year they are away in storage. The good thing is that “G– willing and the creek don’t rise”, they will be there for me to unwrap again next year, surprised at seeing some of them again, and happy to make the house cheerful for the holidays. We took down all the outside lights as well, and fortunately that went rather quickly, and being a rather mild day, we enjoyed being outside. Another reason I delayed in taking down xmas decor was because I had ordered some storage items for garlands and wreaths and also because I was procrastinating. Ok I admitted it. Anyway, they came a couple of days ago and I dug in to reorganize and downsize my xmas stuff. 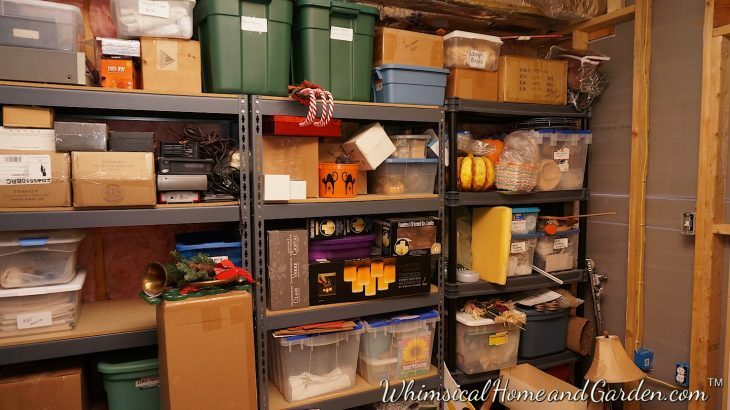 I thought I would share some things I have learned along the way about storing, organizing and making it simple to access and retrieve just what you want for the next holiday season. 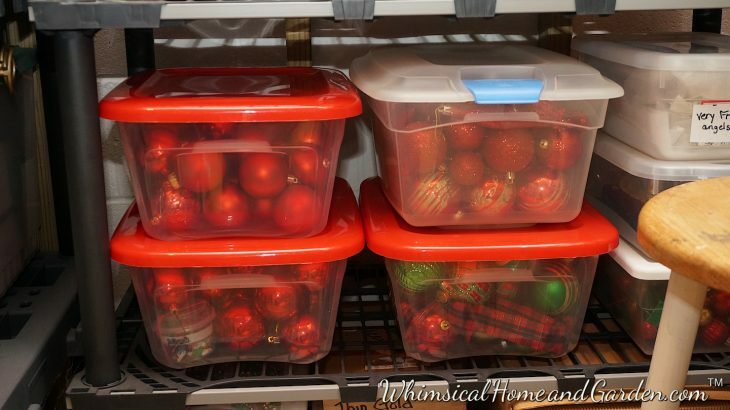 I thought that the red and green ornament storage boxes would be the magic needed for keeping ornaments etc. well protected and organized. Notice also how the solid green containers in the far right corner are basically inaccessible unless I move a lot of other containers. 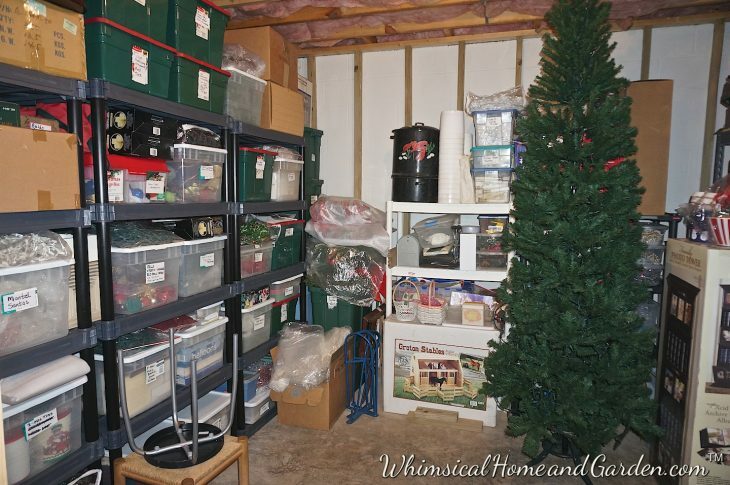 Those are wreaths atop the containers.This had become especially difficult, because the white shelf to the right – can just see the corner of it? Well, it got replaced with a larger metal one during my second decluttering when I was making space for KBJ’s electronic stuff. You can see that a lot of items, although clearly labeled, are in small cardboard or shoe boxes. I organized the ornaments the first go around by theme more than color. This was the gold, pearl and champagne box. And here was the mostly blue. 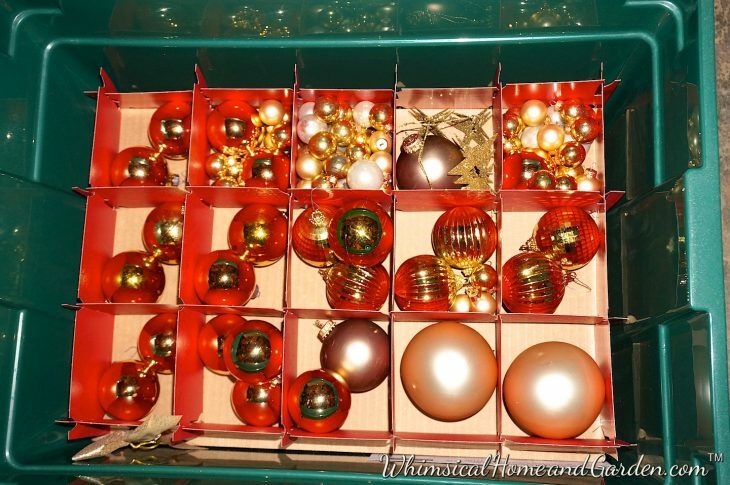 Two problems with this way of storing the ornaments. If I wanted to see what was on the level below the first, I had to carefully lift the cardboard out, and if I wanted something from the one below that, I had to take all 3 levels out just to see what I had. Took too much time, and I would often just say the heck with it. The second problem was that I sometimes wanted a white or silver ornament that was in the blue themed box, and I would search and search. The theme was wasn’t necessarily the way to go for me. Yes, you are probably thinking, well, just have one tree and be done with it. That’s like saying to a chocoholic, you can only have one Hershey Kiss for the entire holiday season. Nada. I will just organize it better. 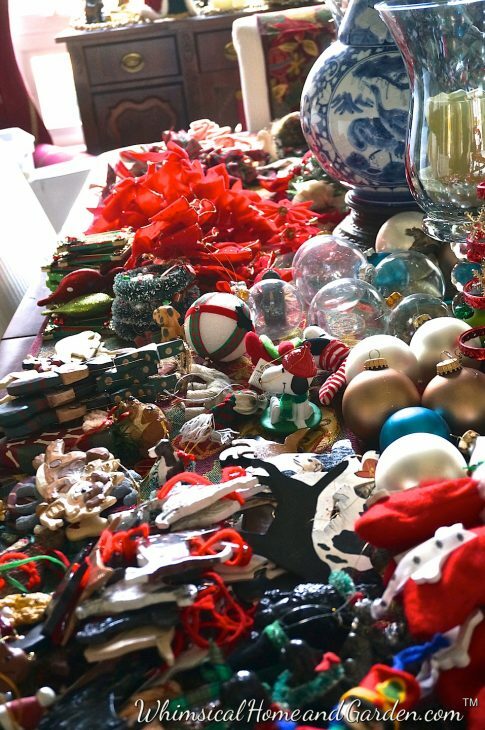 So I emptied every ornament and decoration box, and began to place them strictly by categories that would work for me. 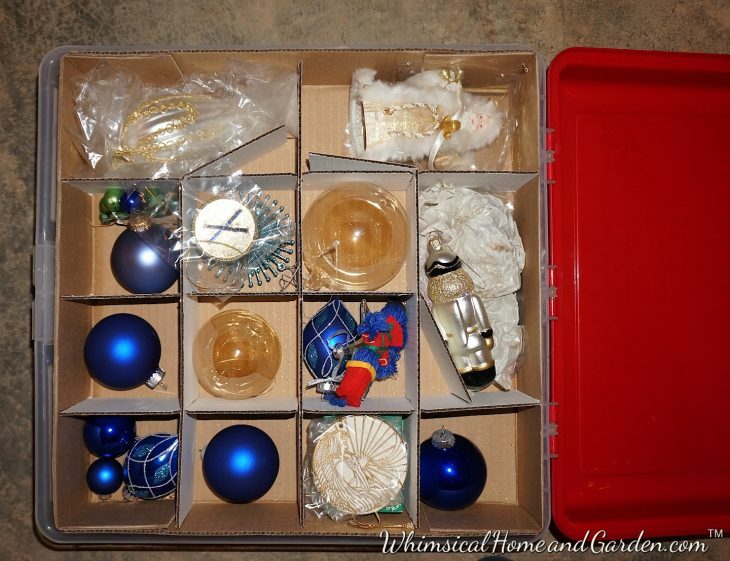 All bulbs would be separated by color, and the only themed boxes would be my dog ornaments, and one that contained only my absolute favorites, those with huge sentimental value, that I loved, and would use every year. It took several days of sorting, but I persisted. 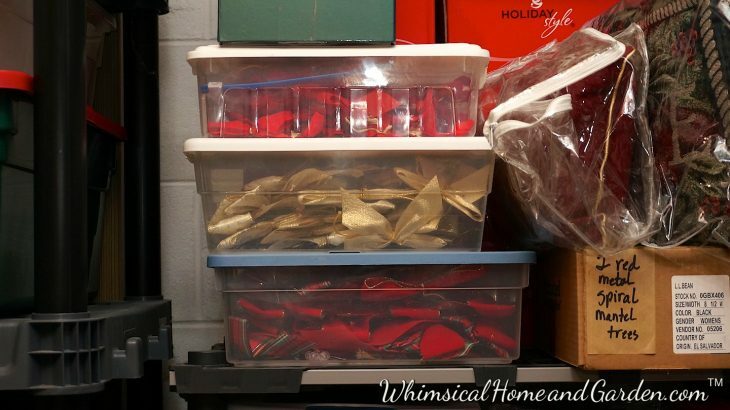 The most important thing I did was fill two boxes with 2 themes that I knew I would no longer put up because I was determined to keep only those that really mattered to me. Don’t get me wrong, it was hard to say good bye to the bear themed tree, and old fashioned ornaments. Looking into the faces of those small stuffed bears, the wood and antique ornaments, many from Germany and all the memories, believe me, it was not easy. But times and tastes change. As I sorted, it did become easier because I knew these ornaments were going to go to a wonderful charity that would gift them to families that might otherwise not have a xmas tree and ornaments. I will give you the info about them at the end of the post and a link. Each time I came across one that mattered, I asked myself if a child or family would enjoy it more. It then became a happy chore to redo the xmas room. So here is the room before except the white was replaced with a 4 ft shelving unit which now made the items in the corner even more inaccessible. I took all the boxes that were on the floor out of the room to sort through as well. My goal was to have the floor completely clear. The first thing I did was ask KBJ to move his electronics to the left side of the room into the corner. 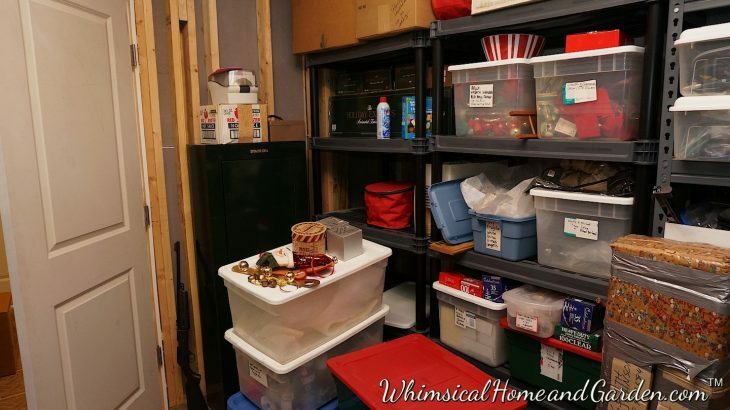 His shelves were 4 foot wide, and mine were three. This would get the bins out of the corner. 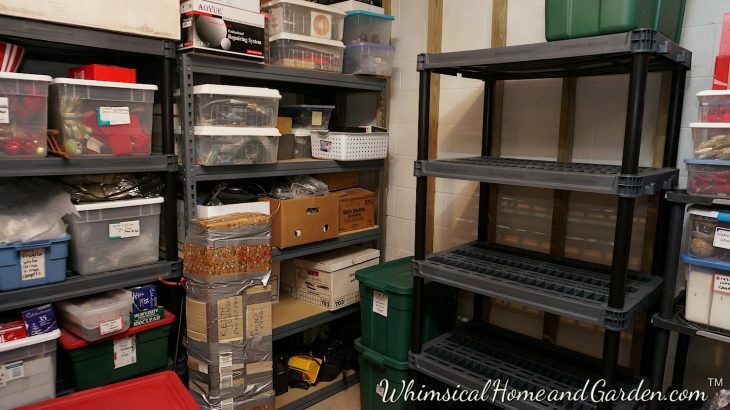 While I ended up stacking a couple to the left of the 3 ft. shelf, now empty, they are very light weight, pine cones etc, so KBJ could easily get to his stuff if he needed to, which was not often. 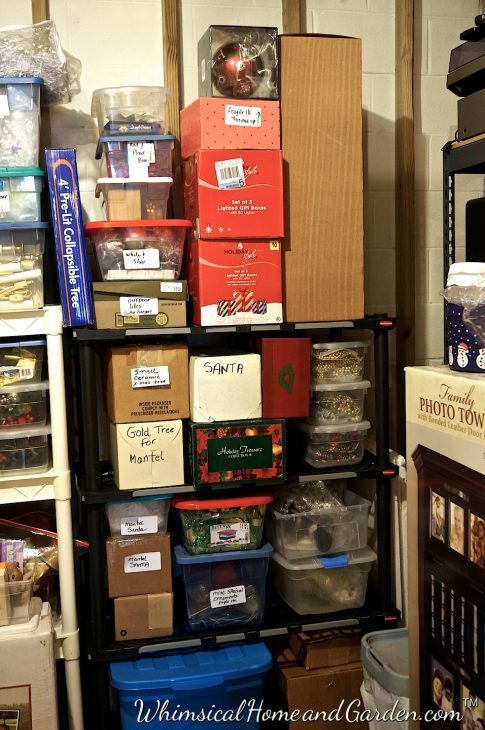 Then all the boxes on the shelves got sorted through in another room one by one. 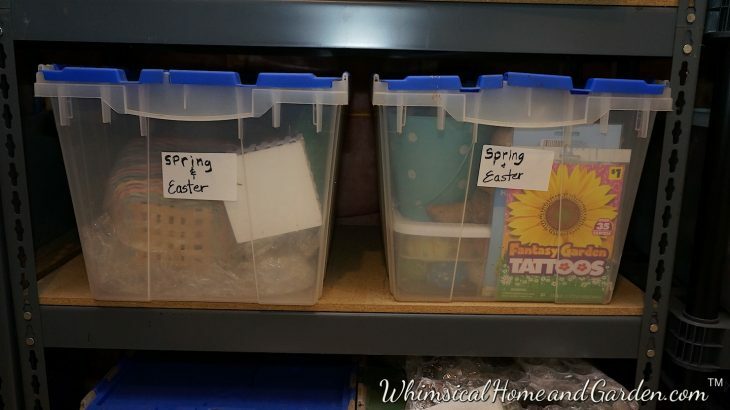 The right side of the room had bins for Halloween and easter/spring and misc craft items. They got the sorting effort as well. I had old lights in bins, and I sorted through them all. I ordered a couple more of these reel units, and now all interior lights are easily stored and grabbed when needed. I checked them all to see if they worked before storing. Check! I put small items in the clear shoe boxes for easy “seeing instantly”. 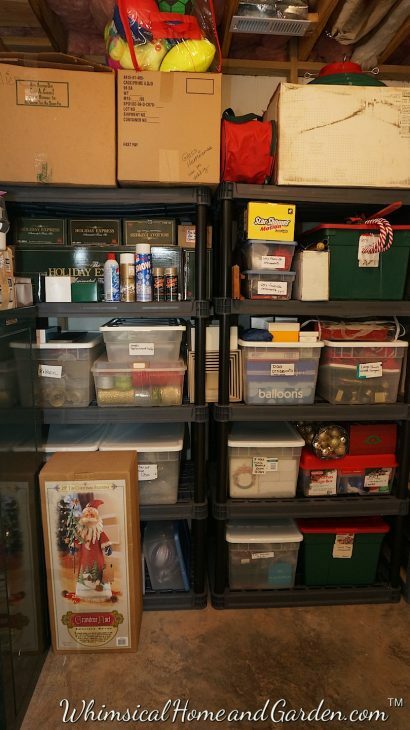 I did the same with bulbs by color, no longer hidden in the boxes with all the dividers. And they take up so much less space. Again, easy to see and grab. I had to run to the Dollar store and purchase a few more clear bins for the large bulbs in order to get them all in one bin. The wreaths are all in the green zippered circular carriers on the top left. I really like these so much better than storing them in plastic and them often getting damaged. I got them on sale at Improvements. They have stiffening boards you insert on the sides, so they can be easily stacked like you see them here. 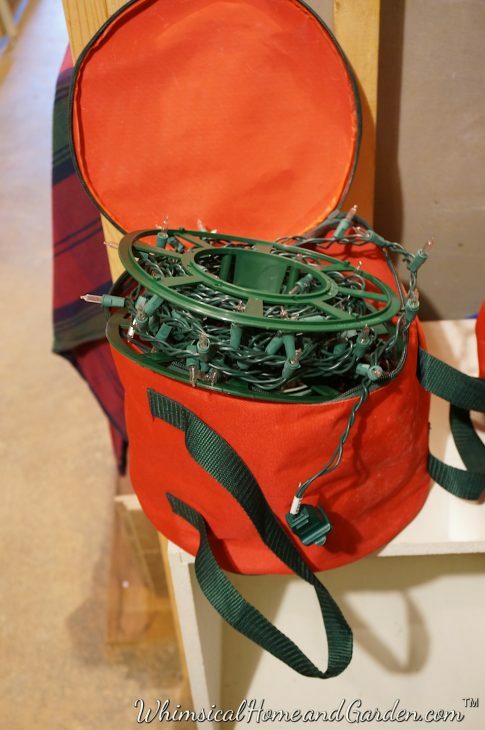 They have tabs on the inside that hold the wreath in place so you can choose to hang them upright. They also have handles to grab to get them down. The room was starting to get into shape. 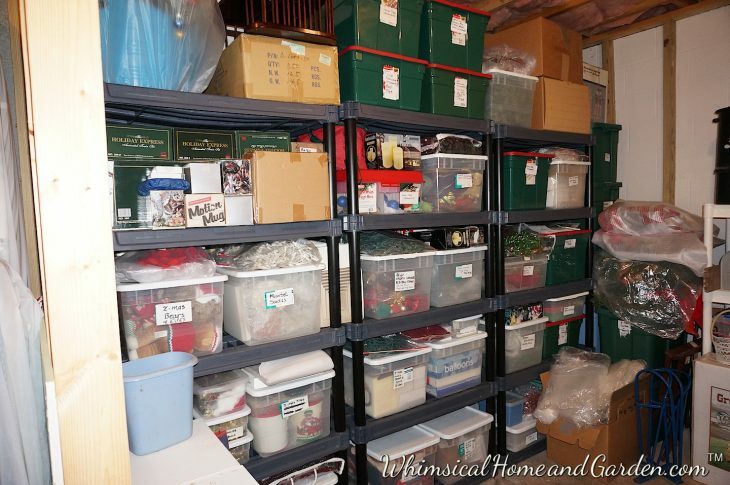 About half way through I began to place the newly and mostly see thru and labeled bins onto the shelves. 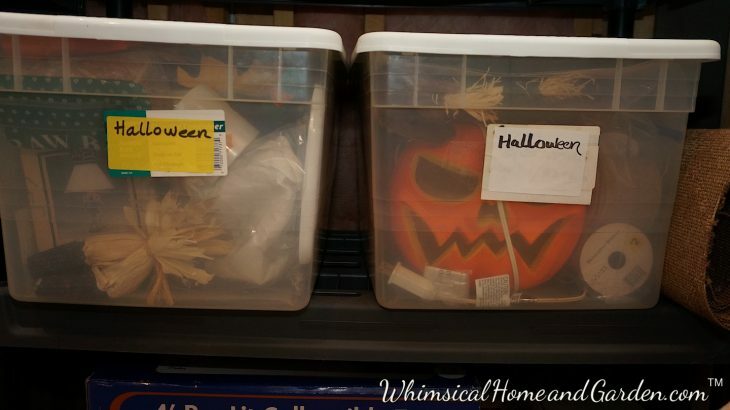 I almost didn’t need labels because I could instantly see what was in them, but labeling allows quicker identification of what’s in the larger bins. 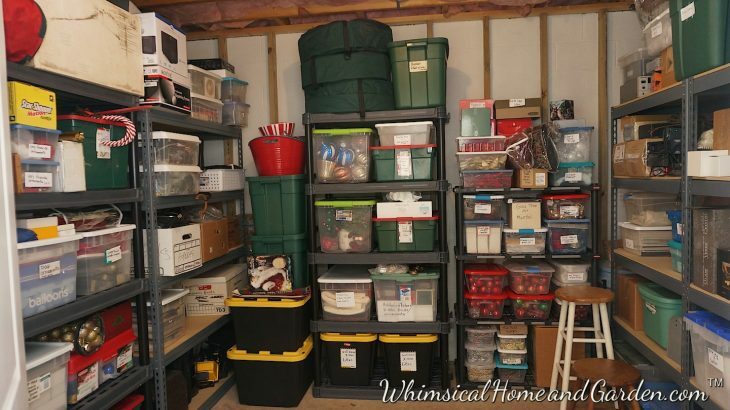 I did the same thing on the right side, putting most everything in clear bins. I probably should have put the friendlier pumpkin face in that bin…..oh well. And now for the final reveal……. Much better, don’t you agree? The two heavier black bins on the left contain my Santas. I put bubble wrap on the bottom of the bin and rolled each in smaller bubble wrap. 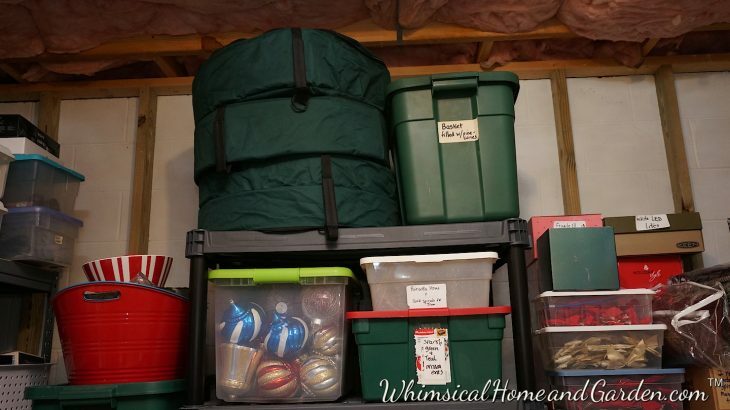 The two heavier black containers on the bottom of the rack contain all the outdoor lights, each set placed in a labeled super sized zip lock bag. Now when we do the outside, we can just grab the entire bin. 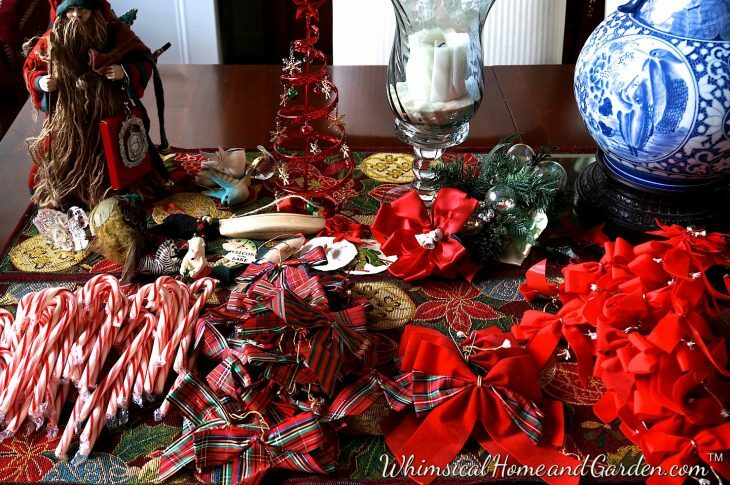 I also purchased from Improvements, similar to the one for the wreaths, but to hold garlands. I bought the large one for two, but it actually holds three. They are really sturdy. The Christmas Tree Project is a wonderful way to assure that all children and families can enjoy Christmas. Donate your trees and ornaments. Address and more info on other ways to help is on their web site. Very helpful information, Charisse! Thanks so much for sharing. I can hear the Santa’s, snowmen, Angels, Pumpkins, Ghosts, and Bunny Rabbits talking now! 😃 They must love the makeover. Thank you. Yeah, not so sure the santas love the makeover. I could almost hear them yelling to me as I wrapped them and put them in the bins, “No!, No!, not 10 months in a container in a storage room!” But I put them there anyway, and they will just have to deal with it! I didn’t decorate much for Easter last year, so packed for almost 2 years I am sure the rabbits will give me “what the —-” when I unpack them this year. That’s life, and I can put them away without any guilt now. I wrote a long comment and then I was disconnected from the internet so now I’ll try it again. Your energy and persistence is amazing. I would have quit after the first 2 boxes. Now I feel like I should go to the attic and try to organize my Christmas boxes but gosh I’d just rather read a book!! Anyway good job. I get so excited when your blog comes up and it is the first thing I look at each morning!! Thanks Susan. It took a better part of several days, but I have actually gone down to look at it a couple of times because having done it makes me feel so good as well as relieved that I actually did it. Most likely I won’t go down there again until easter and then Halloween, but I will not have a feeling of dread now when retrieving what I need. And that’s a good thing! Tom will be so envious of your organization. I always make the effort, but it always fails miserably. Love your ideas.